Two notable wine-industry projects are in the works in the Paso Robles area, one from a veteran winemaker and another from relative newcomers. Stephan Asseo, who began making wine in France in 1982 and established L’Aventure on Paso’s west side in 1998, expects to begin work this month on wine caves and a new, larger tasting room. Fred and Melody Burbank, who planted Burbank Ranch Winery’s vines in 2008, are nearing completion of a winery and tasting room that will offer sweeping views of their vineyard in the El Pomar district near Templeton. The Burbanks are looking to open their showcase on Jan. 1, 2015. Asseo estimates completion in June 2015 if all goes well. Here is a look at what’s in store. Stephan Asseo has long had a dream of building wine caves at L’Aventure, according to his daughter Chloe, who recently joined the family business as director of sales and marketing. The caves, with a half-moon shape, will have an underground temperature perfect year round for barrel aging and storage of library wines, she said. The caves will include a VIP room for vertical tastings, meetings and winemaker dinners, and will connect to the new tasting room. The winery’s small existing tasting room was not really built for that purpose, Chloe told me. “Coming from France, my father never thought that he needed one because in France you just go to the owner’s house and you do a tasting at their house. But here he soon realized that a tasting room is a big part of sales,” she said. The new tasting room will have space for more visitors, but the scale will remain relatively small, and the winery expects to continue its policy of tastings by appointment only. “We don’t want to accommodate too many people at once just because it will lose the whole aspect of us giving a very thorough experience for our tasters,” Chloe said. Stephan Asseo settled in Paso Robles in 1997 for the creative freedom after 15 vintages of making wine in Bordeaux. He was among the first on the Central Coast to introduce unconventional blends of cabernet sauvignon, a Bordeaux wine, with syrah, a Rhône varietal. In France, such a blend would lose its appellation status. When the Burbanks planted their 45-acre vineyard six years ago, they reserved space on a hillside amid the vines for a complete facility including a winery, storage space and tasting room. The two-story building designed by architect Garth Kornreich is built into a steep slope, with about 5,000 square feet of the first floor made up of three concrete underground vaults. Wines will be barrel-aged and cased wines will be stored there with no need for air-conditioning. The rest of the first floor will be the production area. The second-floor public space will have large windows with panoramic views of the vineyard from the tasting bar. 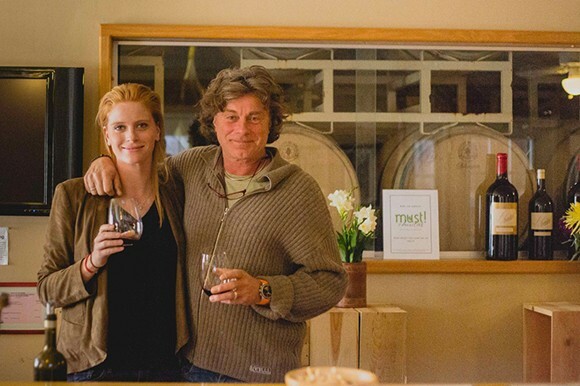 The Burbanks opened their Burbank Ranch Winery & Bistro tasting room in downtown Paso Robles in May 2013. It serves their wines by the flight or glass along with small plates, sandwiches and salads. Their first four vintages have been produced at Paso Robles Wine Services by winemaker Steve Anglim, who has a family-owned wine business in Paso. Anglim will continue to make Burbank Ranch’s wines at the new facility, Fred Burbank said. The new tasting room will also pair wines with food. Burbank said the couple is undecided about whether they will keep the downtown venue open once they move to the Templeton space. Fred Burbank went on to earn a medical degree and pursue a career in psychiatry with additional training as an interventional radiologist doing heart studies and treatment. He has invented medical devices and an anti-theft device, and established three companies to sell them. Melody Burbank, who holds an MBA, has run businesses on her own and engaged in real estate development. When I heard that helicopter tours were being offered with a view of Villa San-Juliette’s Paso Robles vineyards, I wondered if that was the brainchild of owners Ken Warwick and Nigel Lythgoe, the showmen behind the “American Idol” TV talent competition. Tasting room and wine club manager Patricia Kenny said the idea came from a staff member whose husband is a copter pilot for Del Rio Aviation. Kenny said that on the July 5 debut, almost all the slots were booked for 10- to 15-minute flights over the vineyards and surrounding wine country, and walk-in customers filled the remaining openings. The tours, where visitors can sip wine and take in a birds-eye view of vineyards, cost $50 for wine club members and $60 for other guests. More flights went aloft on Aug. 2, and another round is set for Saturday, Sept. 20. Kenny said the winery may continue beyond then if bookings are strong.